Moving to live and work in Thailand if you’ve never been to the country before or if you’ve never had such a radical change is a choice that requires ample bureaucratic preparation, but that’s not all! How to get health insurance. How to send packages from your country to Thailand and vice versa. Contrary to what many believe, living in Thailand is not as cheap as it seems, unless you live in an inland village and are willing to adapt to the Thai style in everything. If you’re idea is to leave for Thailand for a long period of time and leave your apartment and job behind, before leaving it’s good to prepare a real living-plan. Depending on the airline you want to fly with and the health insurance policy you choose, this number can change significantly. When it comes to the visa, there’s little you can do as prices are decided by the Thai government. You can check with the websites of Thai embassies abroad, or read our article on visas to get a more precise idea. However keep in mind that in case you decide to leave without a job and opt for a Thai language school to give you a student visa for a year, the cost starts at an initial 40 USD, plus a renewal every two months (for 1,900 THB) and the cost of the school. The cheapest schools in Bangkok start from 15,000 THB a year, an example being the Sandee School which also has a branch in Pattaya (13,000 THB a year). When it comes to mid-range schools, there are institutions such as the Thai Language Station Bangkok, where a yearly group Thai language course costs 23,000 THB. The highest prices are offered by schools like the Rak Thai Language School, where 5 days of lessons cost 6,500 THB, or the Everyday Thai Language School, which offers 6 months of lessons for 26,000 THB. Some schools also offer the “chance” to work for free in their institution, and so as not to lack anything, to have workers pay for their own work visa. In exchange they promise discounts for entrance to national parks and museums. Well yeah, this option is also possible in Thailand! If you’re not well-versed in English or simply need a grammatical refresher, you can enroll in a 6 or 12 month English course; in this case too you’ll have to get a student visa (ED Visa). When you get to the country, despite it being really easy to find an apartment, you’ll most likely have to spend your first few days in a hotel, and this too is a cost to keep in mind. Hotels in Thailand are very cheap, especially in places like Chiang Mai and Chiang Rai. Even Bangkok and Pattaya offer low cost hotels. Phuket and the islands of the south have slightly more expensive prices. Once you choose an apartment to rent, you’ll be required to provide two months rent in advance and a deposit. The deposit almost always corresponds to a month of rent, so in total you’ll be asked for 3 months rent. To these expenses you must add food, tools you might need and additional expenses that vary according to the situation and person. For various expenses during your first month, such as hotel, medicines, items for your new home, etc, count on at least another 200 USD. Adding it up, you get an initial budget of between 2,500 and 3,000 USD. This total can rise drastically if your idea is to come to Thailand to open your own business, such as a restaurant for example. Some expenses you’ll be required to pay for before leaving, such as your air ticket and visa. Others you’ll have to pay directly in Thailand, so you’ll have to have some cash in local money. My advice is to change your international currency, with exchange counters such as Super Rich. Unlike the banks (especially those in the airport), they don’t take any commission and offer convenient exchange rates. Your choice of city to live in is subjective and can vary on the basis of different factors. Thailand is a country that is rather extensive and offers opportunities for all: from the mountains of Chiang Mai, to the chaos of the capital, to the islands of the south. If you decided instead to study at one of the many Thai universities, whether private or public, I recommend that you choose Bangkok. In the capital you can find many international courses for bachelors and masters degrees, totally in English. If you’d rather learn the local customs and learn the language by living in a less expensive place where they have 4 seasons (which practically isn’t possible in Bangkok since it’s always summer! ), then the best place for you would be either Chiang Mai or Chiang Rai. If you’re retired, or a person with specific qualifications such as a diving instructor, and always wanted to live by the water, in Thailand you have lots of islands to choose from. Work visa and work permit: obtainable only if you meet specific criteria. For more specific information about this and all other types of visas listed, you can read our article dedicated to Thai visas. The first thing to keep in mind is that all international flights going to Thailand land at the Suvarnabhumi Airport in Bangkok. No other city has an airport capable of accommodating jets with such frequency and size. 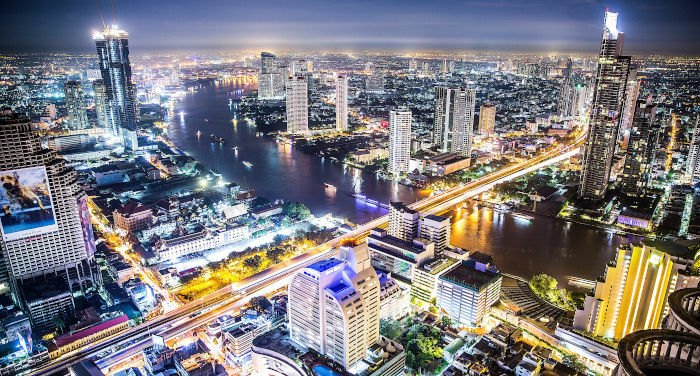 If you’ve decided to move to Phuket, Chiang Mai, Pattaya, or any other Thai destination, consider that you’ll have to catch a connecting flight from the airport in Bangkok. Domestic flights are cheap, for 30-40 USD you can easily buy a ticket with one of the country’s many low cost airlines. It is however an additional cost that you have to keep in mind when preparing your initial budget. There are lots of airlines with international flights connecting Bangkok to international destinations, the foremost being Thai Airways. Another large slice of the market is handled by Arab airlines such as Etihad, Qatar, Oman Air, and Emirates. There’s also the Russian Aeroflot, with a stop in Moscow, Turkish Airlines and many more, all with comparable prices on portals such as Expedia or Vayama. A copy of your flight tickets is one of the documents that you’ll be asked for at the embassy for supplying your visa. Usually it isn’t necessary to buy an incoming ticket and another one for the return, nevertheless it’s often more convenient to buy both and use only the incoming flight. Finding a job in Thailand is becoming increasingly more difficult, especially because of the new, really strict directives for getting a visa and work permit. But it isn’t an impossible undertaking if you have specific qualifications, or already have experience in particularly sought-after sectors such as information. What you’ll need to do is prepare your Curriculum Vitae in English, have all diplomas translated and authenticated and start a search on the basis of the city and field you’re interested in. On the internet you can find various web sites dealing with jobs for foreigners in Thailand, the primary one being Ajarn.com, a portal designed for those looking to work as an English teacher. Other interesting sites are Monster, Thai NGO, Thailand Jobs 77, Thai Visa and Facebook groups like Bangkok Expats, DSBKK, Job seeker in Thailand, and Bangkok Young Professionals. Another method is to show up in person, résumé in hand, at the places where you would like to find a job. Always keep in mind that in Thailand the majority of jobs are prohibited for foreigners. The few opportunities that there are have to do with teaching, information, internal organization, catering (only if you yourself are the one opening the restaurant, you can’t be a waiter or bartender), diving (for example, a diving instructor) and multinational corporations. Private Thai hospitals have excellent standards, among the best in Southeast Asia and even better than many European health centers. It isn’t by chance that many westerners come to Thailand for treatment or cosmetic procedures. Even though costs are lower than in Europe or the United States, having to stay at a hospital in Thailand is not an expense to take for granted. Therefore it’s always recommended to take out a health insurance policy to cover you during your stay in Asia. Unlike Thai nationals, who have access to free medical care, foreigners will have to pay for health care. Many insurance companies require that you buy their services before leaving for Thailand, while other policies can be purchase when you’re already abroad, such as WorldNomads. Renting an apartment or house in Thailand is easy. No documents are required such as a work contract or pay stub, all you’ll need are your passport and three months rent. There are plenty of internet sites with listings, among the most famous are Thai Apartment, Thailand Property, Mr Room Finder, 9 Apartments, Rent Hub and many Facebook pages, like Bangkok Expats. Rent prices vary depending on the area you’re looking in. The capital Bangkok is without a doubt the most expensive; the northern and eastern provinces, like Pattaya, are cheaper: for the same price as a tiny apartment in Bangkok you can rent a whole house. The cost of rent doesn’t include expenses for water, electric and internet. There are no service charges. All accessory expenses like internet, water and electric, can be paid at any 7/11, open 24 hours a day all year long, online and even some at the reception area of the condominium complex where you live. To learn more, read our article on how to rent an apartment in Bangkok. Getting a local telephone number is one of the main things you need to do once you land in Thailand. Not just for being available to family and friends, but also for looking for work. There are mainly three telephone companies that offer prepaid SIM cards and packages: True, DTAC, AIS. True Corporation is the largest telecommunication company. With True you can get a cellular plan, internet connection, telephone landline and even television. The True network is excellent. Here you’ll find deals on prepaid cards. Another excellent company is DTAC. With new prepaid deals Go No Limit, you can buy data packages, messaging and phone starting at 24 THB a day. For tourists using their SIM cards together with the Happy Tourist card, they also offer a package with health insurance that covers accidents, death and a maximum reimbursement of 3,000 THB in the case of lost or damaged baggage. This promotion is good only until March 31, 2018. Up until last year, buying a prepaid telephone card with AIS was really easy: all you had to do is go into any 7/11. At the end of 2016 however, topping them up was only possible in their specialized stores, or online. Prices start from 123 THB a week, for deals that include messaging, calls and 4GB of data. For those who prefer having mobile data only when they need it, by inputting the code *777*70#, you can use 100 MB of internet for 24 hours, at a cost of just 9 THB. Another essential thing to do upon arrival is to open a bank account. Thai accounts can be opened with a work, student or retiree visa. The basic rule is that you can’t open a bank account with a tourist visa, however online you’ll find people who say that they were able to do so. It would seem to be a matter of choice at the bank’s discretion. Other than a passport, phone number and local address, the bank will ask you to present official documents written in Thai from the school you’re attending or company you’re working for. Siam Commercial Bank Thailand (SCBT). There are also many foreign banks. Some examples are Deutsche Bank AG, Bank of America and Bank of China. You can open a bank account very quickly. After signing a few papers, you’ll get an already-activated ATM card and a little book (called a “passbook”) where all transactions are entered. Depending on the type of bank they might also ask for an initial deposit, usually 500 THB. There are no fees for opening or closing an account. The type of bank account you can open depends on the type of visa you have and what you need. Some banks also arrange bank accounts in foreign currency such as the Euro, American Dollar, British Pound and Swiss Franc. Among the main types of accounts are: the checking bank account (the hardest to get because it also includes checks), the deposit account (the easiest to open) and the business account (for businessmen). Unless you booked a ticket in first or business class, where the weight of your bags can go up to even 60 kilograms, the most you can take is 30 kilograms. If however you already have an apartment or want to send personal items that weren’t in your suitcases, you can always ship them. Most national postal services offers international shipping service, where for around 50 USD you can send up to 20 kilograms. An ordinary international package can take up to 25 days to get there (since it’s sent overland), cannot be bigger than 1 meter and can’t have any commercial markings. The only negative thing about this service is that it can’t be tracked. For shipping gifts and souvenirs cheaply from Thailand to your country you can use the postal service. Companies like DHL and UPS offer faster delivery but are much more expensive. – By land (Surface) it cannot be tracked outside of Thailand. It can also take more than a month but is the cheapest option. If you have to send a larger volume you may want to hire an international moving company. You can fill out the form below to receive up to 5 budgets for your move.